A major effort of NIACS is the Climate Change Response Framework, a collaborative effort to support climate-informed forest management and conservation. Visit ForestAdaptation.org to learn more about tools and resources that have been produced as part of this effort. You can also get information about real-world projects that have used the Adaptation Workbook. NIACS supports the USDA Climate Hubs and partners to expand the Workbook to other topic areas such as agriculture, urban forests, forested watersheds, tribal perspectives, wildlife, carbon, sea-level rise and recreation. More and more information is becoming available on climate change projections and potential impacts on natural resources and agriculture. Unfortunately, most of this information doesn't seem applicable because many land owners and managers are unsure how climate change might actually apply at the scales that are relevant to their work. The Adaptation Workbook was created to bridge this gap. 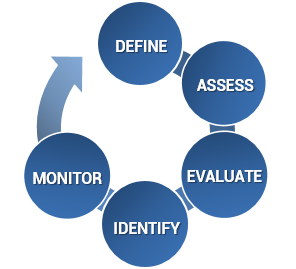 The Workbook provides users with a flexible, logical process to consider climate change information and design customized management actions that can help achieve their management objectives. The Workbook was created by the Northern Institute of Applied Climate Science, and this process is described in Forest Adaptation Resources: Climate change tools and approaches for land managers, 2nd Edition. Complete information about the Workbook and the Climate Change Response Framework is available in that publication. The Workbook is also available for agriculture, which is described in Adaptation Resources for Agriculture: Responding to Climate Variability and Change in the Midwest and Northeast. The Workbook can be used by a diverse range of people working in forestry, natural resources, and agriculture, including biologists, foresters, planners, soil conservationists, and consultants. The Workbook is designed primarily for professionals, but motivated landowners will also be able to use it. People with clear management goals and knowledge about their local ecosystems can use the Workbook, whether they are making management decisions for individual parcels or across a broad landscape. See real-world examples of how forest managers and landowners have used the Adaptation Workbook to consider climate change in their management at ForestAdaptation.org. Swanston, Chris; Janowiak, Maria, eds. 2016. Forest Adaptation Resources: Climate change tools and approaches for land managers, 2nd Edition. Gen. Tech. Rep. NRS-87-2. Newtown Square, PA: U.S. Department of Agriculture, Forest Service, Northern Research Station.161 p.
Janowiak, M.; Dostie, D.; Wilson, M.; Kucera, M.; Skinner, R.H.; Hatfield, J.L. ; Hollinger, D.; Swanston, C. 2016. Adaptation Resources for Agriculture: Responding to Climate Variability and Change in the Midwest and Northeast. Washington, DC: U.S. Department of Agriculture. 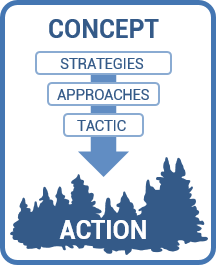 70 p.
Thematic Strategies and Approaches used in Step 4 of the Adaptation Workbook. Regional climate information, and forest ecosystem vulnerability are provded for much of the Midwest and Northeast and are from these documents. Statements are drawn from the Climate Change Response Framework peer-reviewed documents. For areas outside of the Midwest and Northeast (including Alaska and Hawaii), regional information is drawn from the National Climate Assessment (NCA) and the many supporting peer-reviewed documents used to create the NCA to provide some climate impact statements for all regions of the U.S. All climate statements have citations and links to the resource for further reading. Explore climate impacts presented in the Adaptation Workbook.